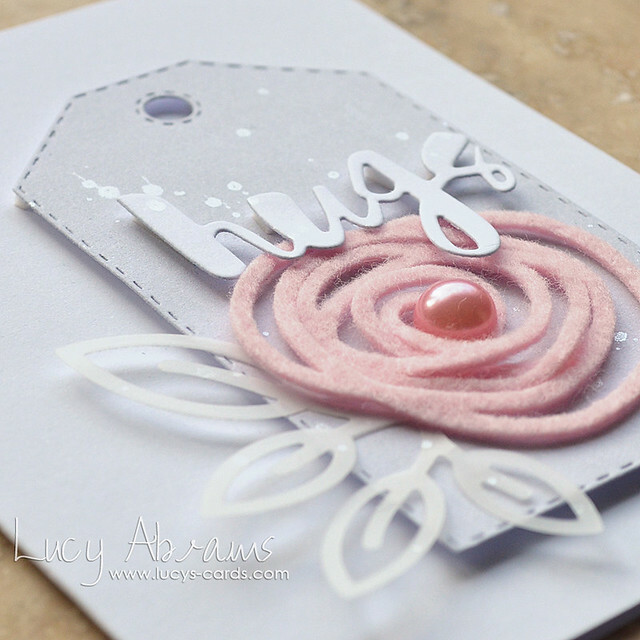 Today I am sharing a card created with a few of the dies. First, I cut some Single Roses from felt and vellum, layered them up and added them to a Stitched Dressed Up Tag die cut from grey paper. I die cut the Painted Hugs from white card, and added to the tag. Finally, I splattered the tag with Calico Shine spray before adhering to a white folded card. Have a great day - and thanks for visiting. What a lovely felt flower!! This is really lovely...the colors are very romantic. Have a terrific holiday. Love the soft pink felt rose! Very pretty! Such a sweet card. The felt is perfect for a warm winter card. Take time with your family - that's always more important! Happy Holidays. Lovely felt rose, and beautiful result! Such a beautiful card!! I love all the textures too! Thanks for sharing. Your card is just so soft and lovely!